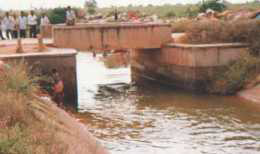 Rajoli Banda Diversion Scheme is an interstate project of Karnataka and Telangana states consisting of an anicut built across Tungabhadra river lies in Raichur district, Karnataka state. The scheme was sanctioned during the erstwhile Nizam state. The construction of anicut was started in 1946 A.D and completed by 1958 A.D. The Water supplied to 143 Km long RDS canal to benefit drought area of 15 villages in Manvi taluk of Karnataka state, and 8 villages in Gadwal taluk, 67 villages of Alampur taluk in Mahabubnagar district of Telangana state and 4 villages in Kurnool district in Andhra Pradesh State.